Is Swaddling Dangerous? ~ My Baby Sleep Guide | Your sleep problems, solved! If you've read many newborn posts of mine, you know that I've a huge advocate of swaddling. I recommend it for pretty much every newborn. And I plan on swaddling my baby girl who is due any day now. make some practices like tummy sleeping less common because parents are less desperate for sleep. And that means less of a SIDS risk. Another win for swaddling. Swaddling can restrict the hips and contribute to hip dysplasia. You can read more about this here. An easy fix to this is to make sure the hips can move while swaddled. The easiest way to do this is to buy a swaddle blanket that is tight around the upper body but allows free movement below the waste. Some great ones are the halo swaddle, summer infant swaddleme and the miracle blanket (a bit trickier to swaddle with but great for babies that break easily out of swaddles). It's also a good idea to allow your baby a little elbow movement while swaddled. Swaddled babies can get out of their swaddle leading to loose blankets in their bed. The easy fix to this is to use a specially made swaddle blanket like the ones I mentioned above. Swaddling can reduce baby's time at practicing gross motor skills. From the research I've looked over, if baby is swaddled when sleeping (when he's not exactly practicing gross motor skills), you don't usually have any sort of delay. But, if you do end up with a delay due to swaddling, baby generally catches up in no time. If you have this concern, discuss it with your pediatrician. Babies that are swaddled too tight may have a hard time breathing. Knowing how tight to swaddle takes some trial and error. You want baby to be nice and snug, but not tight and constricted. Baby should be able to fit her hand on her chest while swaddled (although it may be swaddled by her side). If you find yourself swaddling extremely tight to prevent your child from getting out of the swaddle, try something like the miracle blanket that helps baby stay swaddled without wrapping too tight. Babies can get overheated while swaddled. If this is a concern, swaddle with a thin, breathable swaddle blanket and feel free to put your baby in there with just a diaper. They don't care if they don't have clothes on, I promise! Stomach sleeping can be extra dangerous when swaddled, whether baby is placed to sleep on his stomach or rolls over to his stomach. If baby is being put to sleep on his stomach swaddled, well, there's an easy fix to that so I'm not going to go into that anymore. Now, rolling over from back to tummy while swaddled is a definite concern out there. There are a few things you can do if this is an issue/worry for you. You can try the slumber sheet and swaddle. It helps keep baby on her back without a sleep positioner (which is no longer recommended). I have yet to see this swaddle in action, but it sounds promising, although quite pricey. Keep in mind that you need a specially made sheet and swaddle for this to work. Make sure to get the right sheet size. Some people suggest keeping baby's hands by her face while swaddled so she can self soothe and navigate her position better if she rolls to her tummy. While this has potential to be helpful, in my experience, it generally leads to a whole lot less sleep for baby (usually baby bugs herself with her hands, rather than soothes herself). Lastly, once baby starts to roll, you can simply stop swaddling. This usually gives you at least a few months of swaddling, although some experts suggest discontinuing swaddling by 2-2.5 months to be extra safe. 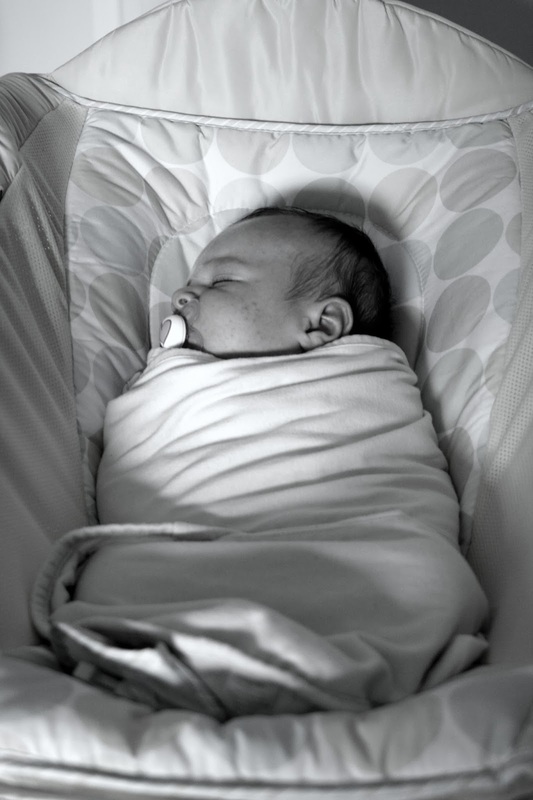 So what are your thoughts about swaddling at home and at daycare? Do you think you'll still swaddle your child now and in the future? I would definitely still swaddle, and your guidelines are great! What is the best way to transition your baby out of swaddling? The other swaddling posts go over that. There are links to them in the above post near the top. Can you point me to the particular post? I just read the posts linked above and the swaddling posts they linked to, and I don't see anything about helping a baby who likes being swaddled to transition out of swaddling. I believe you'll find the info I the comments of the post. I'll try to get to adding it to the body of the post. Swaddling was the only way my daughter would sleep without being held! When we came home from the hospital, my daughter would not sleep unless being held by her daddy or me. We took turns holding her (neither my husband or myself felt comfortable with the idea of bedsharing) for a few hours at a time while the other one got some sleep. My sister introduced us to the Miracle blanket and my daughter suddenly started sleeping without being held! We swaddled her for all naps and at night until she started rolling to her tummy (3 months old), but she wasn't ready to sleep unswaddled (we tried, unsuccessfully), so we simply left her arms out of the swaddle and just swaddled her from the waist down. My daughter is only 5 months old now, but I will definitely swaddle my next when the time comes. We still swaddle. When our baby started rolling over, we asked our pediatrician about whether we should stop swaddling. He said there was no need. This might be related to the fact that at that time our kid had relatively good head control (could lift head without arms and turn it). We started swaddling one arm out (either arm), which seems to work alright. With two arms out, our kid tends to keep himself awake by waving his arms around. I think at this point the swaddle (providing some sort of limb restriction) might be a sleep association. Without it, maybe he doesn't realize, "oh, I should relax and sleep." Swaddling can definitely help a child settle. Like most changes, when u drop it there will be an adjustment period as baby learns to settle and sleep in the new situation. Going from one arm out to two arms out to just having below the arms wrapped is a good transition technique for many babies. Do not swaddle from the hips down if your baby has talipes. The swaddle will keep the foot in the undesired position undoing all of your hard physio work. We just swaddle around the arms and leave it loose below as that's the most important part and it works fine. Thanks for mentioning that bones.